Dramatic day for Israel: Tens of thousands of ultra-Orthodox demonstrators rallied in Jerusalem and in Bnei Brak Thursday to protest the High Court of Justice's decision to jail haredi parents who refused to adhere by the court's ruling regarding their children's schooling. By the afternoon, about 100,000 people accompanied the parents to the Jerusalem police station where they were ordered to report to, ahead of their imprisonment. The protestors were waiting at the site without rioting. An elderly haredi protestor was hurt in the commotion and was evacuated by Magen David Adom paramedics. The parents were ordered to report to the police station at 5 pm, but were delayed by the mayhem. The bus accompanying the parents also transported some children sporting handcuffs as a form of protest. 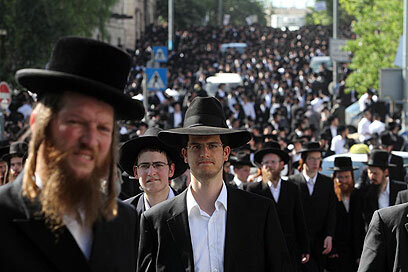 Earlier, more than 50,000 ultra-Orthodox people gathered in the central city of Bnei Brak to protest the High Court ruling against the discrimination between Ashkenazi and Sephardic girls at the Beit Yaakov school in Emmanuel. Some of the parents ordered to be detained by the court were present at the rally, and were carried on the shoulders of some of the participants with dance and song. They then boarded a bus to the Jerusalem police station where they are to be detained. Their bus's progress was blocked by protestors standing on the main road leading out of the city, but police special forces cleared them off. At the same time, more than 60,000 protestors flocked to Jerusalem's Yirmiyahu Street along with signs reading, "High Court against the people" and "God will rule for all eternity". Other Emmanuel parents who took part in the rally held in their honor in Jerusalem also boarded a bus to the station. The protestors carried the parents on their shoulders to the bus, and began to follow them to the station. Massive police forces were deployed across the country to prevent clashes. "More than 10,000 policemen and Border Guard officers will deploy on the main routes and especially at the main places of protest," said Commander Nissim More, head of the operations division at the police's national headquarters. The Bnei Brak rally was stopped for a few minutes after several protestors fainted. Other protestors took advantage of the break to sing and dance. In Jerusalem, paramedics treated eight for dehydration and fainting. The Jerusalem protestors appeared to be enraged with Supreme Court Justice Edmond Levy, who ruled that the Ashkenazi parents who refused to send their girls to school should be sent to jail. "Edmond Levy is the biggest racist in history. This is what happened in the (former Shas Minister Shlomo) Benizri case as well. Where else in the world have you seen such a precedent – adding to the sentence after an appeal? There is a clear trend against us because of our black skullcap," said Amram, one of the protestors. Shmuel Naimi is one of the parents slated to be imprisoned. His son Shimon, 20, told Ynet that "there is no racism in Emmanuel. The education is better, 30% of the students are Sephardic and there is no such thing as separating between Ashkenazim and Sephardim. It's an argument created because of the crazy media." He also expressed his anger at the Supreme Court judge. "I have 10 brothers and sisters and I have no idea what the little ones are going to do. Perhaps Edmond Levy could find them a babysitter." Netanel, a Ger Hasid, arrived to support the Slonim Hasidic dynasty in its battle. "It begins with Slonim and it will reach all of us. I am here to make sure it won't reach Ger," he said. "Who is Edmond Levy to tell me what to do? No one has the right to tell me how to educate my children. The idea that the High Court would intervene is a crime. Any haredi would be willing to go to jail." 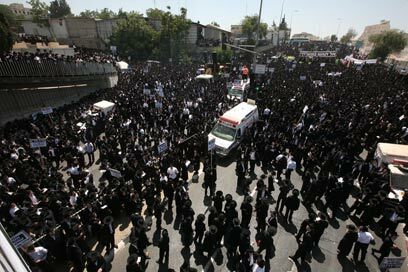 See all talkbacks "Tears, commotion at massive haredi protest "